Never leave the halter on the goat when you are not training. The goat and halter can get caught on something, and this can injure the goat. A bottle-fed kid will think you are part of its herd and respond best to training. Training a goat to halter and lead is essential if you plan to show your animal. It is also necessary if you want to use your goat in harness or as a pack animal. Even for dairy animals, it is useful when moving or exercising the does. Start halter training as early as possible, preferably before the goat kid is weaned. Halter training an older animal can be difficult and potentially harmful to the animal. Let the goat smell the halter and then wear it without a lead to allow it to become accustomed to the halter. Take your time, and do this over the course of a few days. Attach the lead to the halter, and then tie it off to a post of a section of fence. Do not leave the goat unattended during this part of training. Walk away from the goat, telling it to stay. It may fight the lead. However, do not unfasten it until the animal is standing still again. Reward the goat with a handful of grain. Continue this for several days until the goat stands calmly while tied. 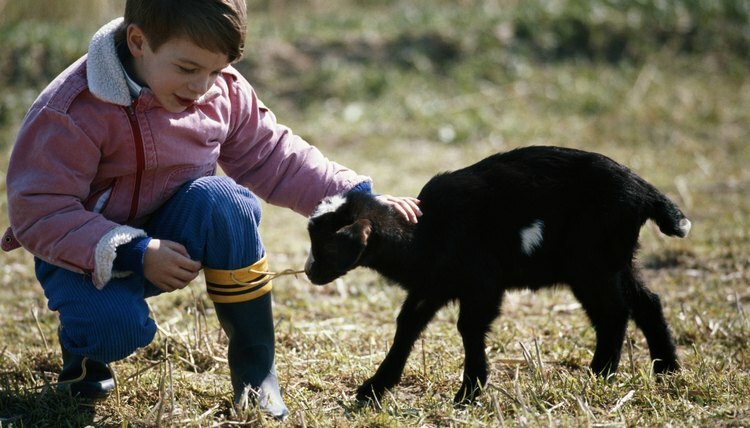 Attach the lead to the halter and take the end of it, but do not try to pull the goat forward, as it will instinctively resist. Instead, walk beside the goat. Lead it to a place it wants to go, at first, rewarding it with a little grain when it walks calmly with you. Slowly work up to longer walks over a period of days, and keep in practice even after the initial training period.